1. Read about the CA Care Therapy first and decide if you are prepared to work hard to heal yourself. We offer no magic bullet. Healing is yours to work for. 2. Come to our centre personally or send your loved ones who know about your case with all medical reports and scans. If you are from another country send us an e-mail. But we must say we are very reluctant to take on patients via e-mails. 3. Fill in First Visit form.4. Sign the Disclaimer and Release of Liability form. 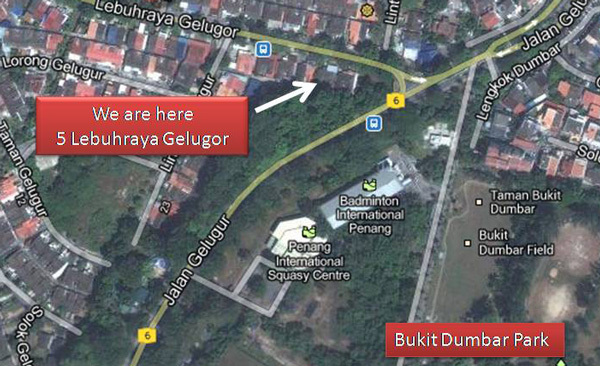 Our centre is at 5, Lebuhraya Gelugor, Penang. We provide free consultation on first come first served basis. However, the elderly or seriously ill gets priority over others. We request you to do two things:1. You need to bring along all your medical reports and give us copies of them. In addition you need to fill in THE FIRST VISIT FORM.2. We require you to sign a Disclaimer & Release of Liability Form. You need to agree to release us from any liability and responsibility in the event that problems or complications arise from the consumption of our herbs.Based on the feedback you give in the First Visit Form and Medical Reports we shall prescribe the necessary herbs. It is therefore very important that you answer the questions asked adequately – give all possible details of your problems. An answer of No and Yes would not be able to help us to help you. Case 1: Helen has breast cancer and one breast has been removed. She is currently on chemotherapy. She suffered side effects like nausea, vomiting, loss of appetite. She is constipated. She has no gastric problem. 1. Capsule A: 2 cap., take 3 times per day on empty stomach. 2. C- Tea: take as drinking water, 1 to 2 liters per day. 3. Breast-M: take once a day (need boiling). 4. Chemo-Tea: take once a day while on chemotherapy. 5. Constipation Tea: take when necessary. Case 2. James has colon cancer that has spread to the liver. His stomach is bloated and distended. He is in severe pain. 1.Capsule A + B: 2 cap. A and 2 cap. B, take 3 times per day with honey water. 2. LL-Tea: take as drinking water, 1 to 2 lietes per day. 3. Liver-P: take once a day (need boiling). 4. Abdominal Distension Tea:for the bloated stomach, take once a day. 5. Pain Tea: take 3 to 6 times per day. Cancer: Type, stage and extent of spread (metastasis). How it started, what doctors you have seen and the treatments given. You MUST provide us with copies of all medical reports. Are you currently on any herbs? If yes, are they effective? Give details. We request you to stop all other herbs if you wish to start with our herbs. You may continue to take your doctor’s medication, nutrients and vitamin supplements but list down what you are taking. 2. Can you sleep? Elaborate. 5. How is your appetite? 9. Cough? What phlegm colour (white/yellow). Itchy throat? 10. Difficulty in breathing? Elaborate. 11. List and explain any other complaints. 1. I have on my own free will, come to seek advice and help from Dr. Chris K H Teo and members of his CA Care team (being a project of CA Care Centre Plt) with regards to my illness. I acknowledge that there is no guarantee or promise that the herbs provided by CA Care can benefit me or cure my sickness. I am aware that I shall be taking the herbs prescribed to me on my own free will and choice and at my own risk. I declare that I shall not under any circumstances hold Dr. Chris KH Teo or any members of his CA Care liable in the event that problems or complications arise from the consumption of such herbs. 2. I am fully aware that Dr. Chris K H Teo and members of his CA Care are giving his/her/their advice free of charge and in good faith to help me with my sickness, which I know is serious. I am at full liberty to accept or reject the advice given to me. I understand that any payment I make is for the cost of herbs and/or supplies only. 3. I also acknowledge that Dr. Chris K H Teo and the members of CA Care have advised me to go for whatever medical treatments necessary and that I am fully responsible for my choices of treatment. 4. I am aware that Dr. Teo and his team are collecting and documenting data on cancer and that my case history is part of this research effort. My consultation sessions with Dr. Teo are video-taped and I have no objection to this. However, in the event that my case history is being documented and published, my real name cannot be used without my permission. Similarly, video clip(s) of me cannot be used without masking my face to hide my identity, unless with my prior permission. Dated: ____________________________ at 5, Lebuhraya Gelugor, Penang. If you have read our articles in the websites: www.cacere.com or www.cacare.org or www.CancerCareMalaysia.com patients do experience miraculous healing. You will note that these patients (or a family member) come here and we do the therapy together. That is the reason why they succeed. I need to see patients every now and then to know what is going on. All Cancer Patients and their Love Ones Read this book! Almost every day I receive e-mails from cancer patients or their loved ones seeking information on how to manage their cancer. There is no way I can answer such queries by writing e-mails. I need to write a book! 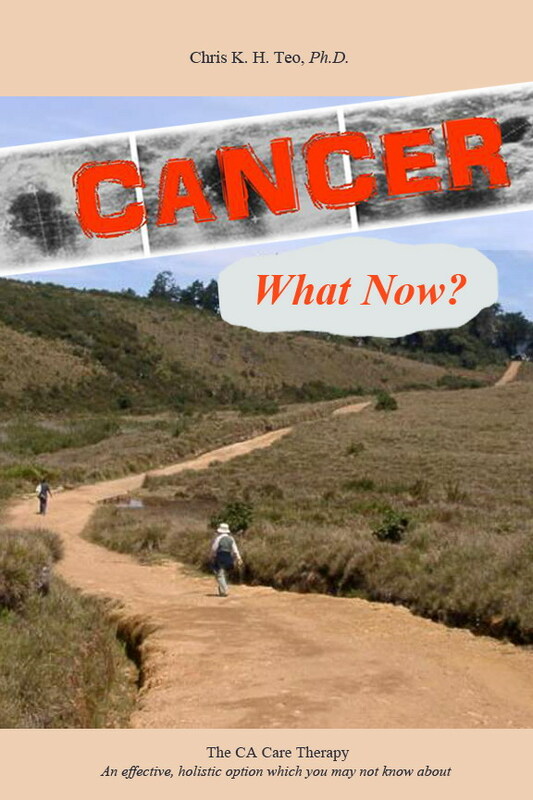 So here it is Cancer – What Now? In these two books, I have tried to answer in detail most of the questions that cancer patients are looking for – What to do after being diagnosed with cancer? or What do I do now that the treatments I have opted for failed? By writing these two books I have spent much time trying to address all your major concerns. It is now your turn to do something for yourself. Read and understand what I have written, that is if you want to know my views about cancer. With this background knowledge, I hope it will help you plot the next stage of your cancer journey. If you do not wish to read books, okay browse through this website and you would probably learn as much. Someone wrote: “It isn’t because doctors are bad people. It is because they themselves do not have the answers, although they are trying their best to help with what they know”. Unfortunately, along the way they are taught that other non-medical ways are not proven, not scientific, not FDA-approved and therefore are suspect. To them alternative therapy practitioners are quacks, charlatans and pushers of snake oil. May the stories in this website bear witness to the truth.